we were in charge of making pasta salad as a side dish for our family's fourth of july picnic this weekend. instead of making either an italian dressing based pasta salad or a mayonnaise based macaroni salad, we decided to dress our pasta salad with pesto. we absolutely love pesto. there are so many different types of pesto. traditional basil pesto is what we used for this recipe, but i bet this salad would also be good dressed in arugula, mint, and pistachio pesto or sun dried tomato, parsley, and almond pesto too. 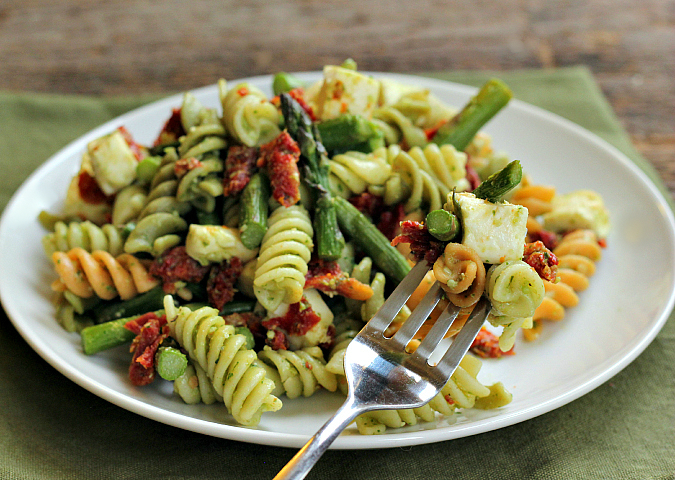 the pasta is covered in delicious homemade pesto, full of fresh ingredients. 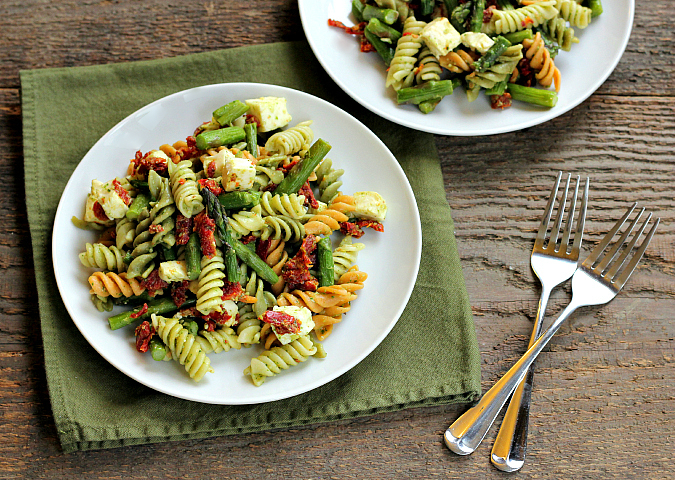 it is tossed with sun dried tomatoes, asparagus which was roasted in the oven until it was super tender, and cubes of fresh mozzarella cheese. yum! 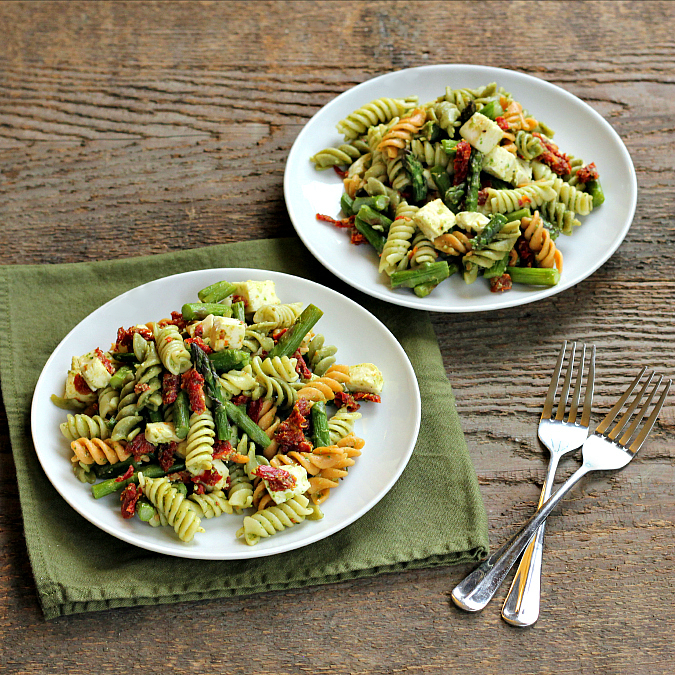 this pasta salad is an easy dish to make and it is perfect as a picnic side dish, or as a main meal for a busy week night. we served this pasta dish cold as a salad, but you could certainly serve it warm too. the warm mozzarella would melt into the pasta and that would be delicious! bring a large pot of water to a boil and cook pasta according to package instructions. drain, then rinse under cold water. preheat your oven to 425 degrees F. cover a baking sheet with aluminum foil and grease it with olive oil. trim the ends off the asparagus and place the asparagus on the baking sheet. toss with additional oil and season with salt and pepper. roast for 10-12 minutes until tender. set aside to cool. once cool, cut into small pieces. 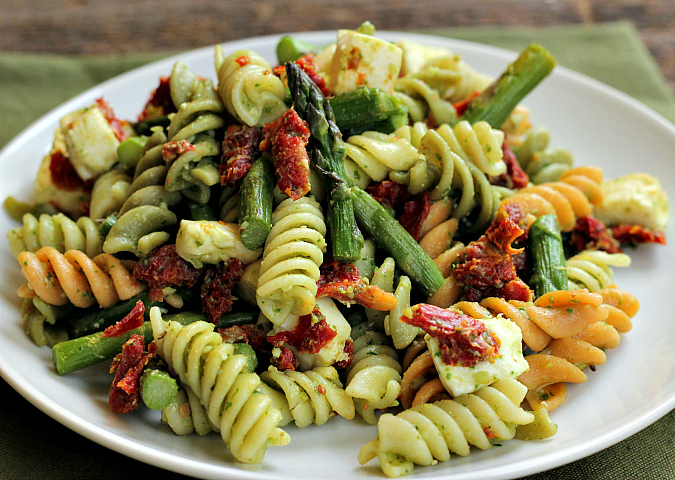 in a large bowl, combine the pasta and the pesto. toss well to make sure the pasta is evenly covered. 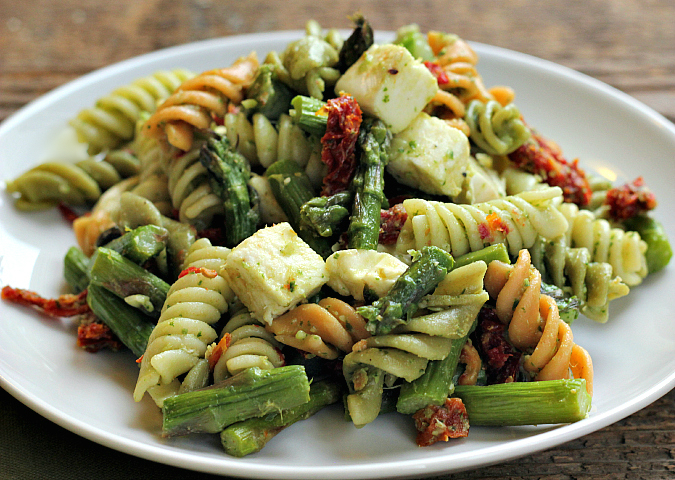 mix in the asparagus, sun dried tomatoes, and mozzarella. refrigerate until ready to serve. That pasta salad was very good. Love the basil flavor.